Show off your new clothing line and boost your sales in no time with Placeit's eye-catching visuals! Try this duffle bag mockup featuring a colorful environment, a minimalistic and elegant way to display your design. Are you ready? Choose your favorite bag mockup and improve your marketing strategy right away. Boost your new clothing line with Placeit's outstanding visuals and make your designs display in a professional-looking way! Try this duffle bag mockup featuring a colorful background and customize it to show off your brand online. Amazing, right? It's go time! Choose your favorite bag mockup and start creating eye-catching visuals to improve your sales. 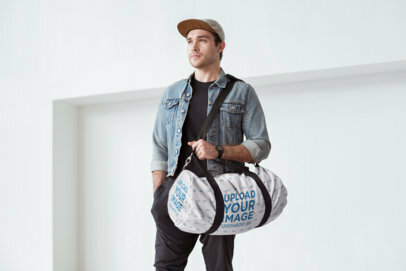 Create gorgeous visuals to promote your latest duffle bag designs with Placeit's mockups and see how your revenue grow after improving your company or brand's image marketing. Start now by choosing an awesome visual, this one will do the job perfectly! Then use it to create an image to show your latest product design. That's it! Start sharing it and watch your sales grow after using beautiful images from Placeit. 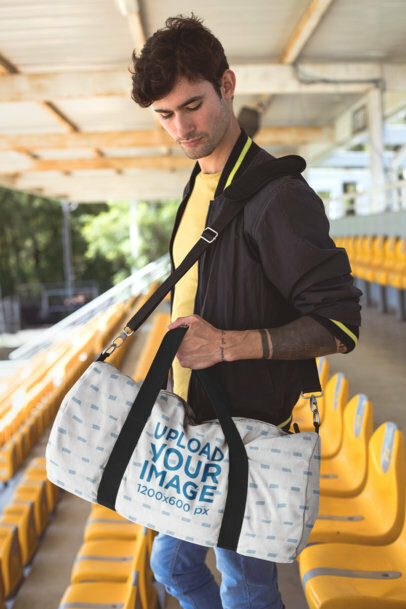 Create gorgeous duffle bag images to promote your latest design with Placeit and see how your revenue grows after using amazing visuals that your customers will definitely love! Using photorealistic visuals is a great way to take your image marketing to the next level. Start now and make your income grow with Placeit's visuals! Did you make an awesome design for your gym bag? Want to see how it would look on an actual model? Welcome to Placeit! We create amazing mockups that feature the best locations, models, settings, and more. Like this one featuring a woman sitting next to her duffel bag. It's fashionable, trendy and professional. You can even change the gym bag's color! Try it out, it's easy. 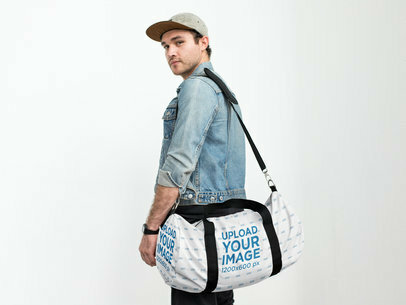 Create gorgeous visuals to promote your latest design for a duffel bag with Placeit! 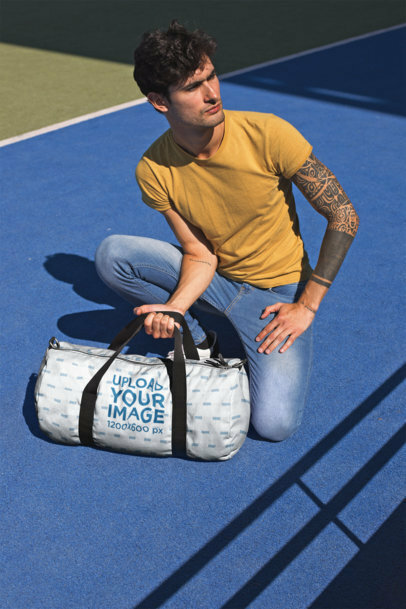 This urban sporty scenario is a great visual choice to market your latest design for a gym bag, use it and promote your latest duffle bag design with a beautiful visual that will match with your design and brand's style. Start now and make your sales grow with cool visuals! 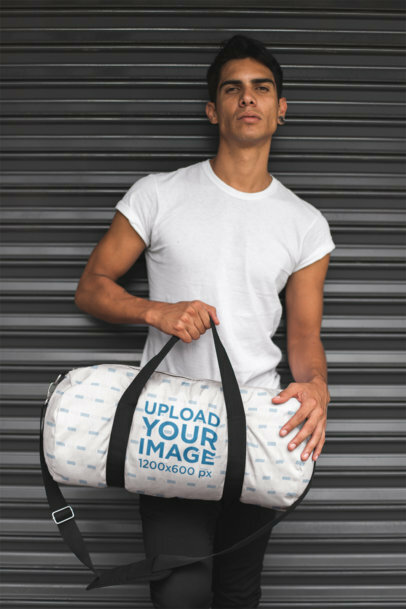 Create an image to promote your latest duffle bag design with Placeit and make those sales grow by showing a more realistic version of your product! Start using gorgeous visuals to market your duffle bag designs and watch your sales grow. Placeit has tons of visual products that you can use to improve your image marketing, use them now! Create awesome visuals with Placeit's mockups and promote your latest products' designs with beautiful visuals that your audience will love. Use our amazing mockups to showcase your amazing designs and make your audience see a more realistic version of your latest designs for a duffle bag! Start using Placeit and make your revenue grow by improving your image marketing. Start promoting your designs with Placeit! Placeit creates amazing mockups that feature the best locations, models, settings, and more. 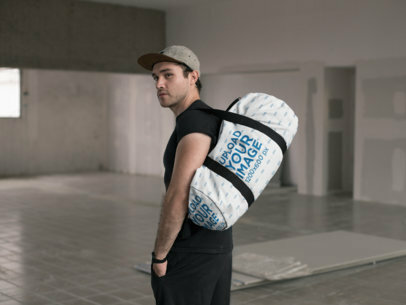 This mockup features a man carrying a duffle bag across his shoulder. You can even change the duffel bag's color! It's super easy to use and you don't require any additional software. Try it out! 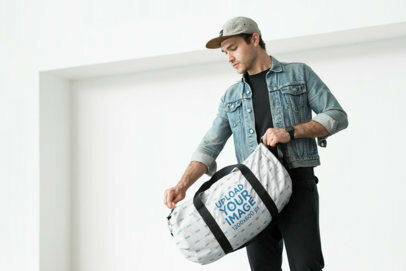 Create a beautiful visual using an awesome mockup that will help you promote a duffel bag design! Start making your sales grow with great visuals that will make your customers fall in love with your brand. Placeit has thousands of different mockups for you to promote any product you have. Use gorgeous visuals from Placeit and see how your revenue grows! 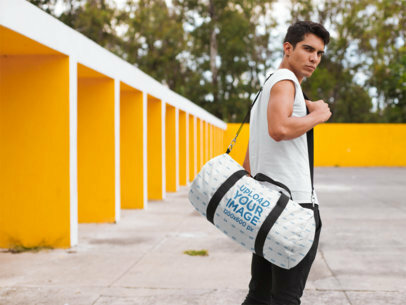 Edit the perfect duffle bag mockup and start promoting your designs! Use Placeit's mockups that feature amazing locations, models, and settings. No additional software or download is necessary. You won't even have to hire a graphic designer, you can do it on your own. Try it out, it's incredibly easy. 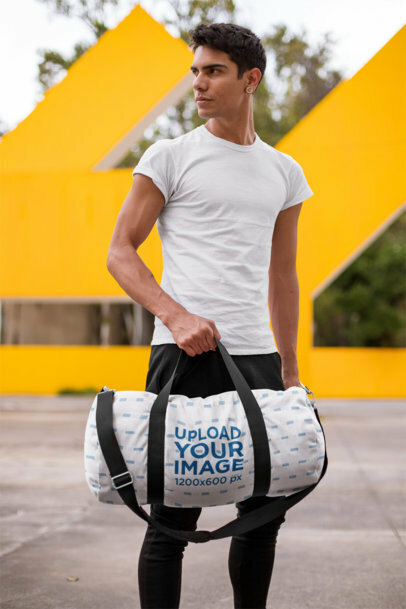 Take a look at this beautiful visual of a model holding a gym bag while outdoors, it's an awesome choice if you are looking to promote your latest designs online using a visual that will drive your customers to purchase your products. Use Placeit and create cool visuals that will help you sell more duffle bags to your customers! Promote your designs on with Placeit's mockups! Our gym bag mockups have the best locations, models, and more! This one features a muscular athletic man carrying a duffel bag. Pretty on trend, right? You can also change the duffle bag's color! Try it out, it's easy. Make the image your own now and start advertising your latest gym bags in a professional way! 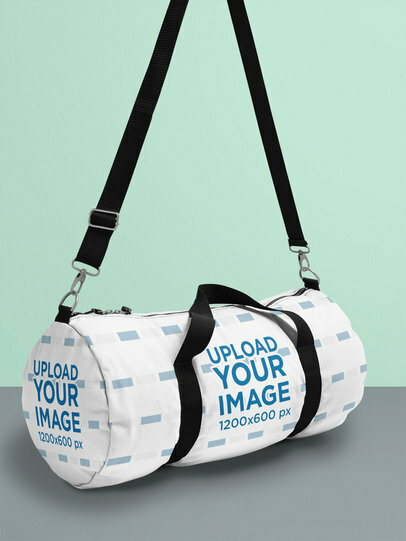 Use this gym bag mockup and start promoting your designs! Placeit has some of the best mockups out there with amazing locations, models, and settings. Like this one featuring a pensive young man in an empty room with his duffle bag. You can also change the bag's color! Cool, right? Edit your duffle bag mockup now. This awesome visual is a great choice for you to promote your design for duffle bags, start using Placeit and market your latest designs with beautiful images that your customers will love. 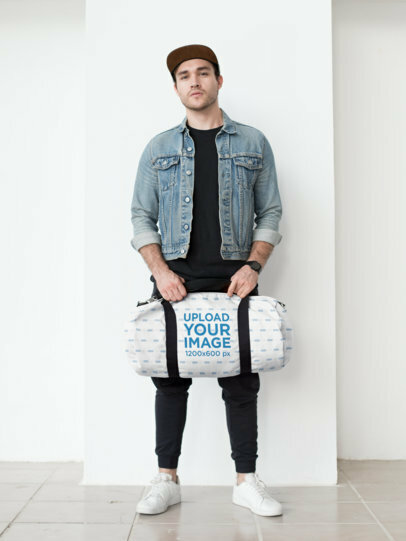 Start creating visuals with Placeit and promote your duffle bag designs with an awesome image that will show your audience a real-life version of your product! 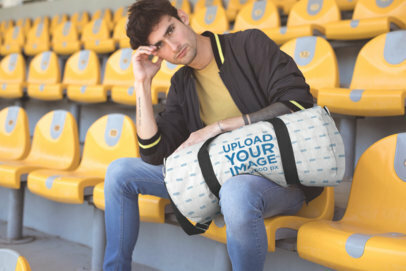 Promote now your latest designs for a duffle bag with Placeit's mockups and make your customers see the real-life version of your latest design! This awesome mockup is a great choice for you to market your latest design in a great way. Use Placeit's mockups now and show your designs with beautiful visuals that will make your customers love your brand! 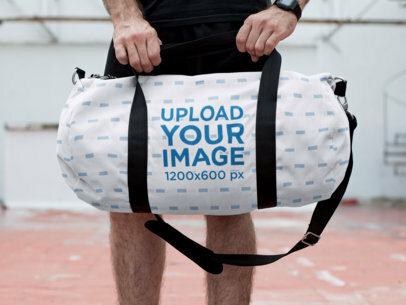 Use this gym bag mockup and start promoting your awesome designs in a creative way! We make amazing mockups just for you. Try this one featuring a man holding a custom duffel bag, you can change the duffle bag's color and easily add your own design. Try it out, it's easy! Create a beautiful visual featuring a girl carrying a gym bag and promote your latest designs for them with images that will make your customers fall in love with your products. Start using Placeit and market your latest design for a gym bag using an amazing visual asset that your audience will love. Showing a more realistic visual to your audience is a great way to generate a stronger interest in your products. 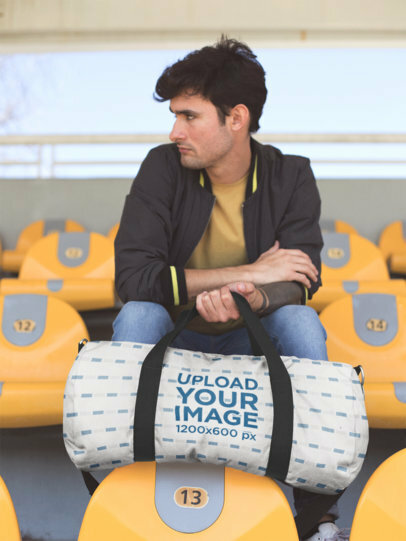 Create an awesome visual to promote your latest duffle bag design and make your customers see how beautiful it is in real life! Start using Placeit and show your audience a photorealistic version of your latest designs. Using images that match your brand's personality is an excellent way to show your audience what your products are all about. Use this mockup and start promoting your duffle bag designs! It's amazingly easy, you don't need additional software or downloads. You can even change the duffel bag color! Cool, right? Try it out, it's easy. Placeit offers you the best models, locations, and settings. Edit your gym bag mockup now. Edit you duffle bag mockup with Placeit! We create mockups that feature the perfect locations, models, and settings. 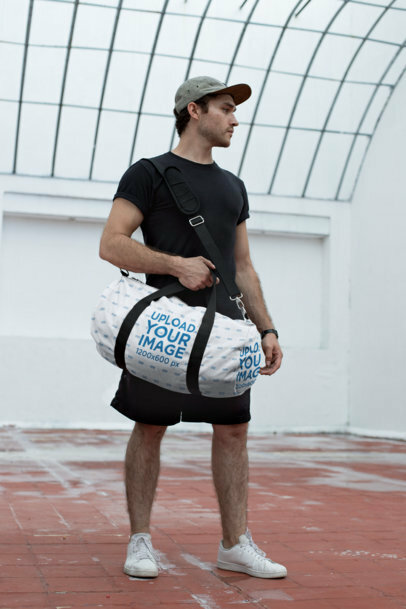 Like this mockup featuring a handsome model carrying a duffel bag. You can really make this images your own by selecting the exact color you want on the gym bag. Pretty cool, right? Create a beautiful visual featuring a man holding a duffle bag while leaning against a closed store's metal curtain, show a cool image of your latest design with Placeit's mockups and make your customers see a more realistic version of your products! Start now, promoting your products with beautiful visuals is an excellent choice if you want to make your sales grow. Hey, you found our duffle bag mockups! We create mockups with awesome locations, models, and settings. Like this one, featuring a fit woman modeling a kit bag. Your design will be the first thing people see and you can even change the bag's color. Try it out, it's easy. Edit your duffle bag mockup with Placeit! It's super easy and you can even change the duffel's color! Our mockups provide the best locations, models, and settings. You don't have to download any expensive software or hire a graphic designer. Cool, right? Make the image yours, promote your gym bag design now. 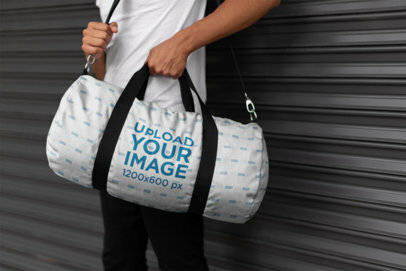 Use this duffel bag mockup and start promoting your designs. Placeit creates amazing mockups that feature awesome models, locations, settings, and more. Like this one featuring an athletic man heading to the gym. You can also change the duffle's color. Pretty cool, right? Try it out, it's easy! Use this mockup to promote your duffel bag designs. Placeit has a ton of amazing mockups featuring the best models, locations, and settings. This one features a strong muscular man modeling a duffel bag. You can even change the duffle bag's color. Pretty cool, right? Edit your kit bag mockup now. Do you have an awesome duffel bag design that you want to show off? Use our mockups, we have a ton of cool models, trendy locations, and fantastic settings. Like this one featuring a fit man modeling a duffle bag. You can change the duffle bag's color! Pretty awesome right? You no longer have to spend a fortune on expensive photo shoots. Try it out, it's easy! Edit your duffel bag mockup now. 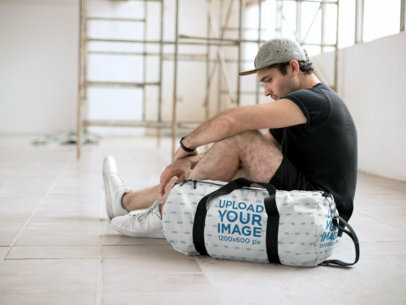 Edit your Duffel Bag Mockup with Placeit! Our mockups are super easy to use and don't require any additional software. You don't even need to hire a graphic designer, you can do it all on your own. 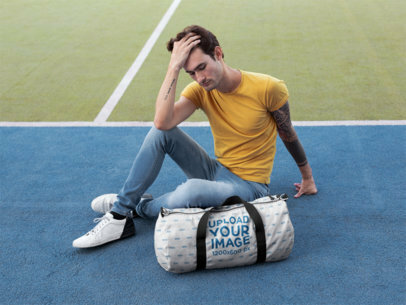 This mockup features a fit man modeling a gym bag. You can change the gym bag's color! Try it out, it's easy! Promote your latest design for a duffle bag with Placeit's mockups, using beautiful visuals is an excellent choice if you are looking to market your designs using visuals that will make your audience buy your products. Start now and show a more realistic version of your duffle bag design with a mockup from Placeit! Take a look at this beautiful visual asset, it's a great choice if you want to promote your latest design for a duffle bag in a realistic way. Showing your audience a more realistic visual of your designs is an excellent way to make them understand what your products will look like in real life. 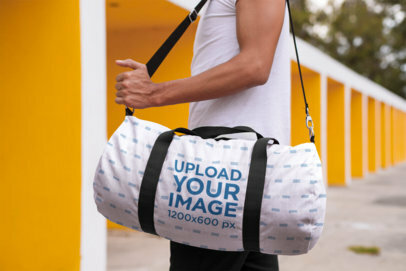 This duffle bag mockup is a great choice to promote your latest design! 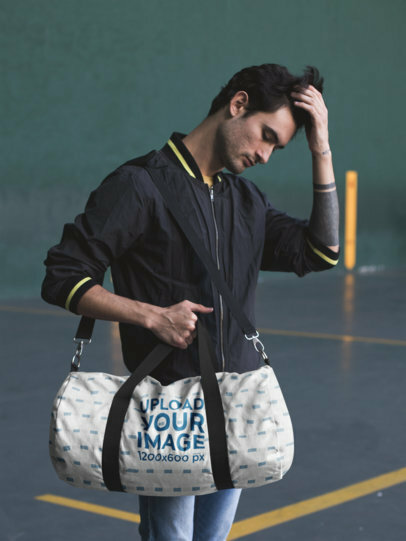 Create a cool visual to promote your latest design for a duffle bag and make your customers love your designs by seeing them in an equally enticing image. Promote your designs with a colorful environment image such as this one, to make it stand out or have contrast with the picture. Use Placeit and make your sales grow with gorgeous visuals! 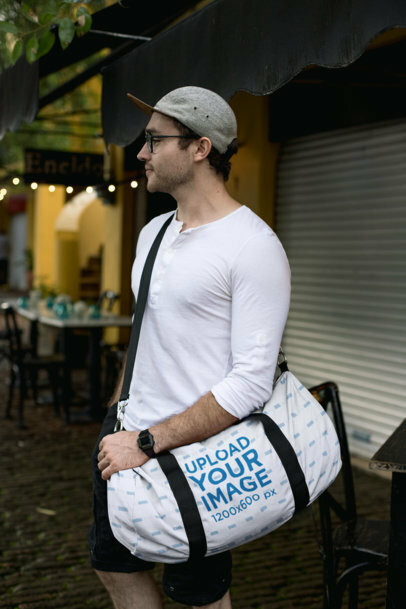 Promote your latest design for a duffle bag with Placeit's visual and make your audience see what your awesome duffle bag design will look like in real life! Using beautiful visuals to market your products is a really smart thing to do, your customers will not only fall in love with the design you're selling, they'll also understand its personality and get to understand it better. Like this mockup? It features a trendy and handsome man carrying a gym bag. Placeit's mockups are made with the best locations, models, and settings. You can also change the gym bag's color. It's super easy to use and you don't even require additional software. Edit your duffel bag mockup now. 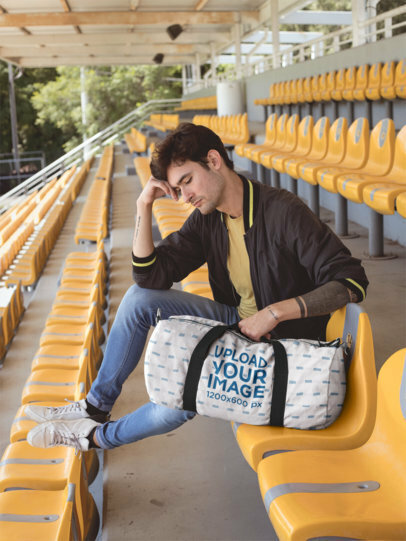 Take a look at this awesome mockup featuring a man sitting against a wall while with a duffle bag, it's a great visual that you should use to promote your latest designs in a better way! Use awesome visuals that will help you showcase your designs using an image that will help you make it stand out. Use Placeit and make your sales grow with cool visuals. Did you make an awesome duffle bag design? Want to see what that looks like on an actual model? 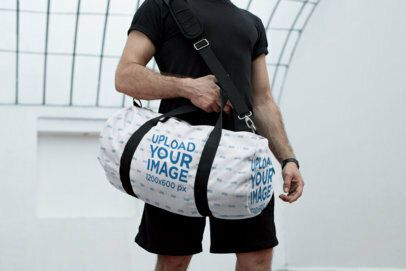 Use Placeit's Duffle Bag Mockups! Our mockups feature the best models, locations, and settings. Like this one, it features a handsome man carrying the duffle bag wearing a trendy athleisure wear outfit. You can even change the duffel bag color to your style. Pretty cool, right? Edit your gym bag mockup now! Take a look at this awesome visual of a duffel bag, it's an excellent image that you should use to market your latest gym bag designs in a better way! Showing off your latest designs with a beautiful visual asset is an excellent way to prove to your audience that your products are high-quality. Use Placeit's mockups and show your designs with gorgeous visuals! Start promoting your latest designs for duffle bags with Placeit's mockups and make your customers see what will your products look like in real life! 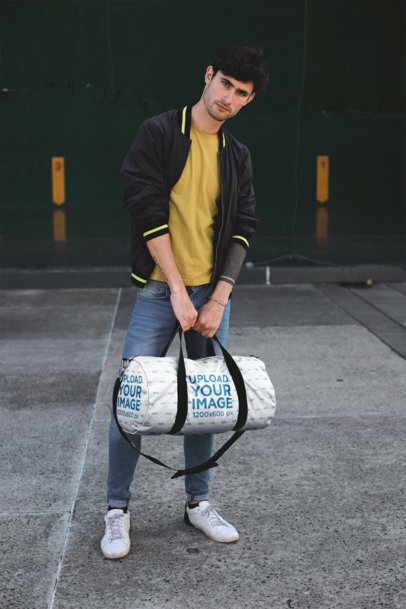 Use Placeit and market your latest duffel bags using beautiful images that will make your audience fall in love with the designs you're selling. Sell more duffle bags with gorgeous images. 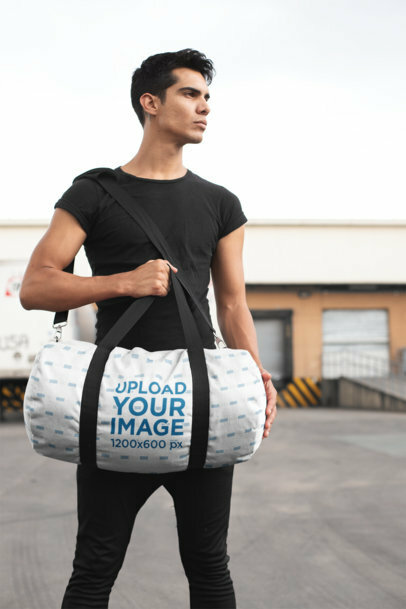 Promote your designs with Placeit's mockups and make your audience see how awesome your duffle bags are by showing them a photorealistic visual that they'll love. Using an image with a sports environment will enhance your gym bag designs. Start promoting your brand with Placeit's mockups and make your audience fall in love with your products! 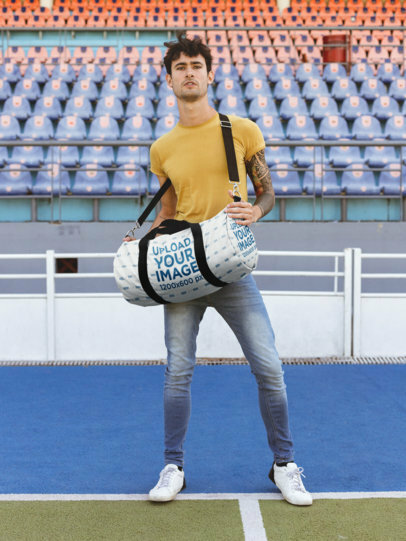 Take a look at this gorgeous visual of a man with a duffle bag at a sports scenario, use it now to promote your products. It's an excellent choice if you are looking to market your latest duffle bag designs to your audience in a photorealistic way! Placeit's mockups will help you get to your customers' hearts with gorgeous images that will help you transmit your brand's personality. Start promoting your latest designs for duffle bags with mockups from Placeit and see how your audience starts paying more attention to your brand! Using beautiful visuals is a central part of good image marketing, by doing so your audience will connect better with your brand and feel more attracted to it. 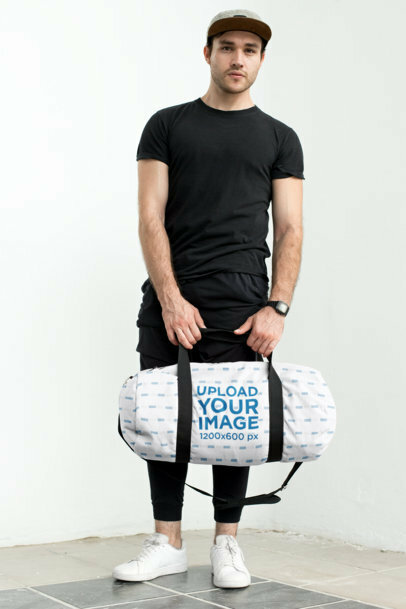 Make an image of a man holding a duffel bag now with Placeit and promote your latest designs for a gym bag using awesome visuals. Show your customers what your designs look like in real life with beautiful mockups from Placeit and help them connect more to your brand's personality. 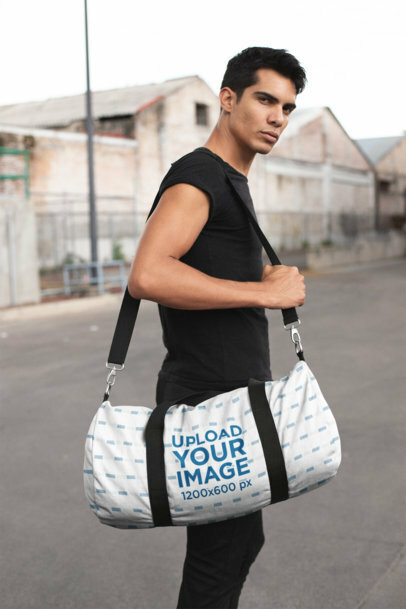 Create your own duffle bag image to promote your latest design for a gym bag and make your audience fall in love with your designs! Using a photorealistic image featuring your design is an awesome choice if you are looking to promote your products in a way that your customers will love. Placeit will give you cool images to promote your products, start now and sell more gym bags! 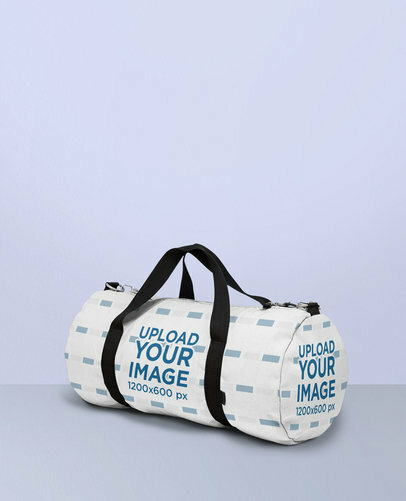 Use this mockup to promote your duffle bag designs! Placeit has a ton of mockups just for you! We offer the best locations, models, and settings. This one features a man in a stadium sitting with his gym bag. You can even change the duffel bag's color. 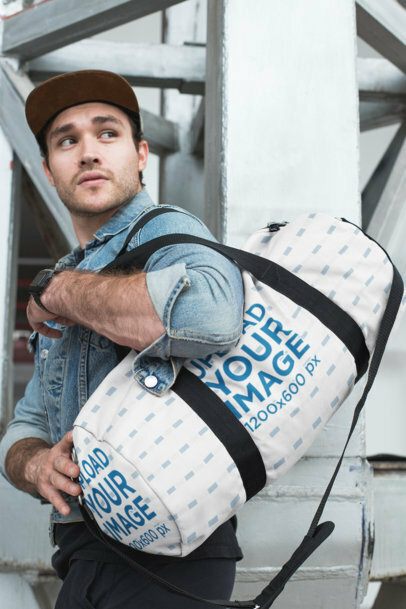 Create your duffle bag mockups now! Did you create an awesome gym bag design? Want to see how it looks on an actual model? Use Placeit's mockups and start promoting your designs! 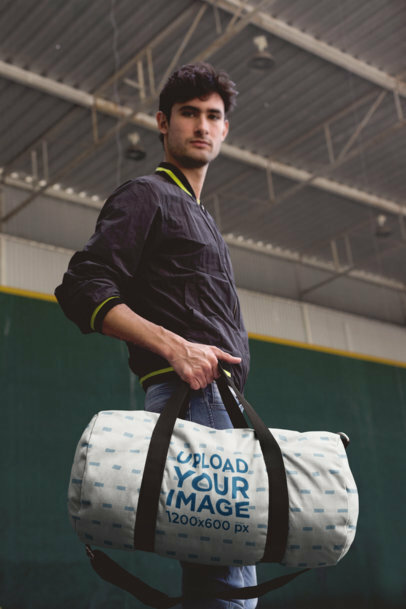 Like this mockup featuring a handsome man modeling the duffel bag. You can even change the bag's color. Pretty awesome, right? 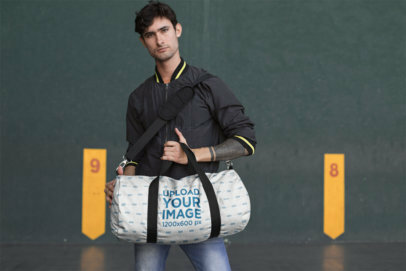 Edit your duffel bag mockup now and start promoting! 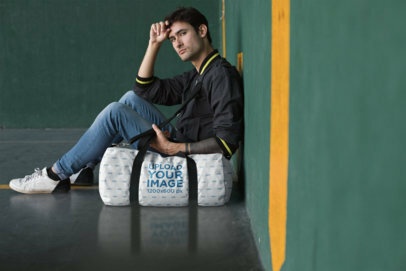 Start promoting your latest duffle bag designs with Placeit's mockups and show your audience how great your products are! Seeing the visual of a real-life product is an excellent way for your audience to understand what it'll look like in real life. 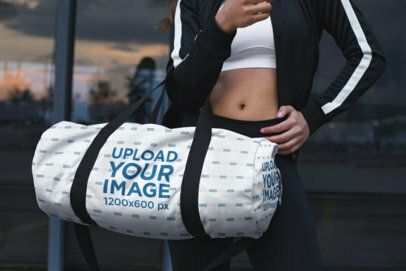 Showcase your gym bag designs with a mockup from Placeit and make those sales grow! 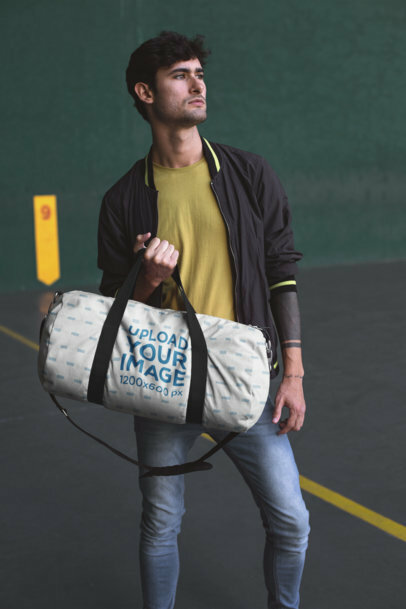 Use this awesome visual featuring a man holding a duffle bag and promote your latest designs for a duffle bag with an awesome image that will convince your customers to buy your products! Start now and promote your gym bag designs in a sports-related environment. Use Placeit and sell more duffle bags with awesome mockups! Looking for a way to show your latest duffle bag designs in an awesome way? 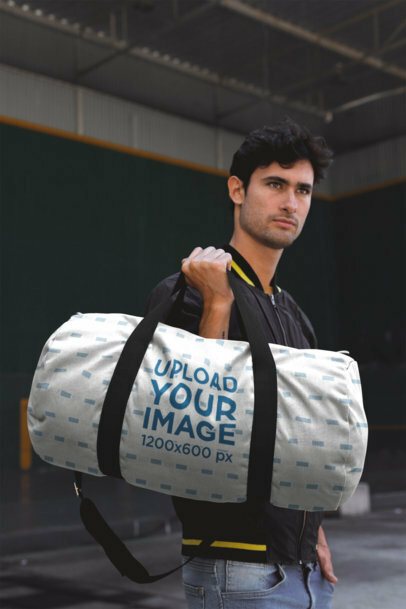 Use Placeit's duffle bag mockups and start promoting your sports bag designs in a way that your audience will adore. Gorgeous photorealistic visuals are amazing to market your designs while showing your customers how the gym bag designs will look like! 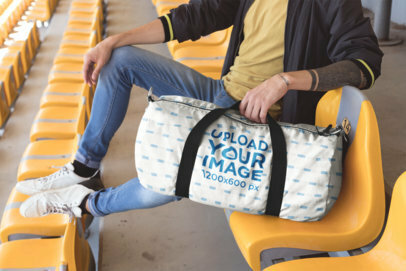 Use this Duffle Bag Mockup to promote your designs! We make mockups that are easy to use, trendy, and super eye-catching. We offer the best locations, models, trends, and more! This one features a handsome man holding the duffle bag in a sports facility. Pretty cool, right? You can even change the duffle bag's color! Try it out, it's easy! 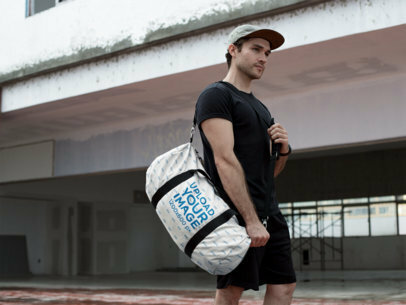 Have a cool gym bag design that you want to see on an actual model? 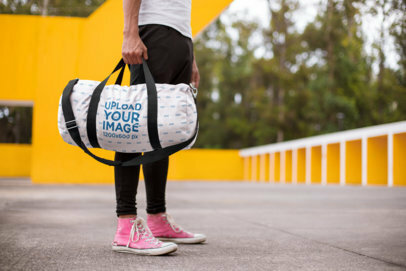 Use our duffel bag mockups! We create each mockup with a trendy style, easy to use settings, cool locations, and models. Like this one, featuring a man holding a duffel bag in a sports court. You can even customize the bag's color. Edit your Duffle Bag Mockup now. 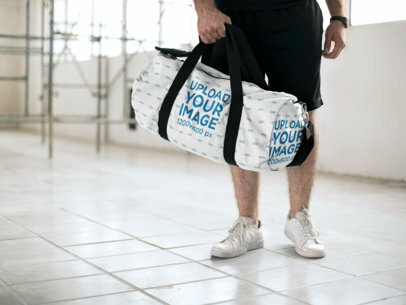 Use this duffel mockup and start promoting your gym bag designs! Placeit offers the best mockups with amazing trends, professional models, and locations. Like this one, featuring a handsome model picking up a duffle bag. It's pretty cool, and you can even change the gym bag's color. What are you waiting for? 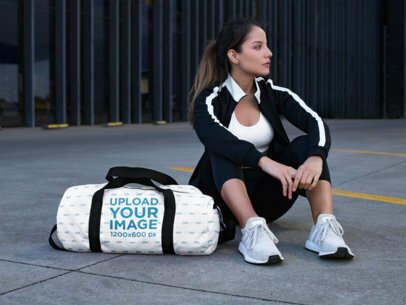 Edit your gym bag mockup and start promoting your designs!